The Anti-Civilization Lawyers Union is dropping a lawsuit against the Patriot Act. The ACLU said in a statement that it was withdrawing the lawsuit filed more than three years ago because of "improvements to the law." "While the reauthorized Patriot Act is far from perfect, we succeeded in stemming the damage from some of the Bush administration's most reckless policies,"
Well, I'm glad to know that the George W. Vichy Administration and his Vichy Congress have satisfied the enemy's demands. That's what we have a government for, after all: to defend all enemies, foreign and domestic, against attack by the United States. Teddy Roosevelt: Speak softly and carry a big stick. George W. Vichy: See, we gotta speak uuuuuuuuuhhhhh tough and, and, and, carry a uuuuuuhhh white flag. Wolf Blitzer on CNN was interviewing Lynne Cheney just now.... Blitzer was throwing all sorts of irrelevant questions, and Lynne was throwing them back in fine form. No defensiveness. Finally Lynne asked Wolf: "Are you on our side?" First time in my life that a pro-American politician has forced a Leninist to state his loyalty. Wolf came back with "Of course I'm on our side." To which Lynne said [approximately]: "Then why don't you act like it?" Some guy bought a new fridge for his house. To get rid of his old, still working fridge, he put it in his front yard and hung a sign on it saying: "Free to good home. You want it, you take it." For three days the fridge sat there without even one person looking twice at it. He eventually decided that people thought it sounded too good to be true, so he changed the sign to read: "Fridge for sale $50." The next day someone stole it. True or not, it illustrates an important truth. People like to pay lower prices, but beyond a certain point they wonder if they're getting a worthwhile product. Apply this to government. The Laffer Curve unquestionably works. Forty years of experiments have proven that the right kind of tax cuts will give more revenue to the government. But when Republican politicians have no other marketing technique than "We will lower your taxes", they are missing the other side of the purchase. Taxpayers expect to get something meaningful from government. Not necessarily a check, but at least a visible and understandable service. When the only thing they hear is "Low Price!" they automatically think "Bad product." And when Bush decides not to tell us how many enemy soldiers we're killing, he's not just yielding the propaganda advantage, he's missing a big chance to give us something understandable and meaningful in return for our taxes. He opens our minds to the thought that we may be paying less, but we're getting nothing at all. The worst thing about a low-quality executive is that it makes the job tremendously harder for later and more competent administrators. I saw this happen here in Spokane. For many years the city gov't was totally corrupt, pouring millions of dollars directly into the pockets of the Cowles family while doing very little for the rest of the taxpayers. The corrupt clique was broken up (by a local talk-radio host) in 1997, and since then the city has been trying very hard to undo the damage. They've been fixing thousands of potholes and sewer lines with very little added taxation, and they've been extremely careful about transparency. The citizens are still highly suspicious, and the city hasn't been able to raise taxes or pass bonds, even though the extra money might be genuinely needed. Broken trust takes a long time to rebuild. Short thoughts on various things. Ashcroft being interviewed on Fox News just now. Says: "It would be absurd for the US, being a nation of immigrants, to be seen as shutting out immigrants." Oh? Why would that be absurd? Just because we did something in the past, we don't have to keep doing it. If that were true, we'd be saying things like: "It would be absurd for the US, having been built by slavery, to abolish slavery." So my question is, how can we measure victories? How can you measure winning? The last couple of years there just doesn't seem to be any signals or signs that we're winning. THE PRESIDENT: That is the significant disadvantage we have in this war because the enemy gets to define victory by killing people. ... I don't know what Harry Truman was feeling like, or Franklin Roosevelt. But I do know ... that at Midway, they were eventually able to say two carriers were sunk and one was damaged. We don't get to say that. A thousand of the enemy killed, or whatever the number was. It's happening; you just don't know it. WE DON'T GET TO SAY THAT? George, aren't you the boss? Aren't you the one who decides whether we inform our own people of our successes, as any normal leader would do in any normal situation, let alone a war of propaganda? Or is someone else the boss? Teddy Kennedy? Prince Bandar? Saddam Hussein? JUST WHO IS IN CHARGE HERE? Rush just got himself into trouble. Talking about Michael J. Fox's commercial for a Missouri senator, on the subject of stem cells.... Rush is saying that Fox is faking and exaggerating the effects of Parkinson's disease for the sake of dramatizing the commercial. Nope. Fox's hyperkinesia is not the result of Parkinson, but rather the result of the drugs that combat Parkinson. In fact the effect of Parkinson itself is rigidity and stiffness; the drugs (generically described as L-Dopa) cause lots of extraneous motion. This is variable and intermittent. Every time Rush treads into the realms of science he makes a fool of himself, which is totally unnecessary. If you are trying to maintain credibility, you need to figure out which parts of life are outside your expertise. Later: Rush heard from his staff, and backed off. Still, it's frustrating because his basic point here is important and valid: The political stem cell debate is false, and is doing nothing for the patients. Most of the progress, even in countries with entirely different politics, is in adult and umbilical cord cells. American scientists, who are largely leftists, would rather poke Christians in the eye than make progress in science. I could sound equally silly if I tried to talk about Sport, an area of life that I know precisely nothing about. For instance, I could say "Bush is acting like an outfielder without his skates, trying to tackle a five-iron into an extra basket." Or "This election reminds me of the last time OSU lost the World Series in a halftime under-par goal." I'm pretty sure those are phenomenally absurd, but not entirely sure. For all I know, they might be excellent analogies. So I simply avoid the whole subject. I had reached the "had enough" point several months ago, and was getting set to vote for Dems on the national level this time. Last night, the campaign for Cathy McMorris (the R incumbent in this congressional district) put out a TV ad that almost caused me to change my mind. "Did you know? Goldmark thinks Bush caused 9/11!" It then refers to the Seattle paper on Oct 6. This was indeed an eye-opener; if Goldmark is among the "Truthers", who believe that 9/11 was a vast fake, with no actual hijackings and no actual planes, then he would deserve to lose. So I looked it up.... And it turns out that Goldmark was saying something entirely different. [Goldmark] has also taken up journalist Bob Woodward's claim that senior Bush administration brass received but ignored warnings of an imminent al-Qaida attack. 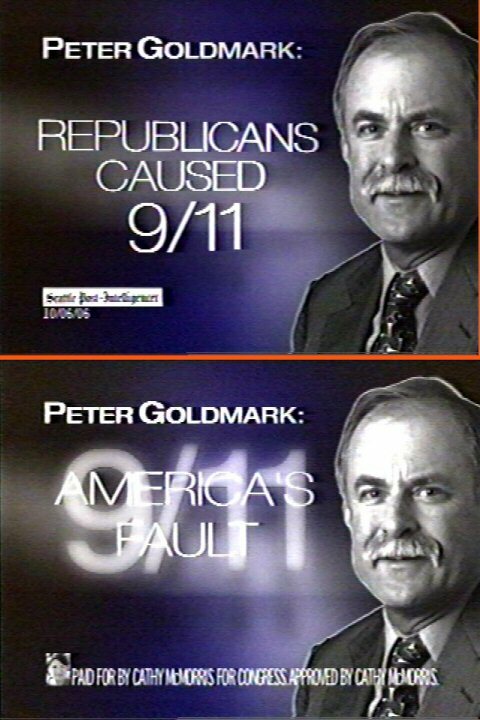 "9/11 was directly attributable to George Bush and the Republican administration," Goldmark told a Seattle fundraiser. Granted, he was stretching what Woodward said. In fact, Woodward's point was the same thing that our "little Churchills" have been trying to tell us for a long time. Our government, for various reasons including bureaucratic gridlock and fighting the last war, has been totally ignoring the Mohammedan threat as it gradually built from 1979 to 2001. This is unfortunately normal; we always fail to see new threats until they knock us over. Pointing this out is not as good as offering realistic plans to fix it, but it's emphatically not the same thing as the paranoid fantasy of the "Truthers". A man arrested as a terror suspect for allegedly trying to transport $340,000 from a group tied to Libyan leader Moammar Gadhafi, and who reputedly had connections to Osama bin Laden, helped write the "Religious Expression in Public Schools" guidelines issued by President Clinton during his tenure in office. Think about this for a minute. True, Clinton appointed Traitor Hamilton to office. But she's still in office, despite committing many specific acts of sabotage. At the time when Clinton appointed her, we were not at war. Now we are, and she's still allowed to ruin our war effort. I've been hitting this point from various angles; finally found a concise way to state the central problem. Both teams in our political "debate" have agreed to use the same false view of reality for their own purposes. This is exceedingly strange. Normally, opposing teams use opposing distortions. The false view of reality comes in many variations. Using the 'D' team's phrasing: Bush is a cowboy, Bush is a unilateralist, Bush tramples on civil liberties, Bush is a warmonger, Bush would rather drill for oil than educate the children, Bush hates immigrants, and on and on. The 'D' team considers these things to be bad, and the 'R' team considers them to be good. Most of them would in fact be good in wartime. We desperately need a President who uses his power unilaterally, ignores the UN, forces land to be used for drilling, tramples on the civil liberties of traitors and saboteurs, controls the nation's borders, and makes war fiercely and unwaveringly until the enemy is defeated. We don't have such a President. In each of those categories, Bush is basically carrying on the Clinton policy. We won't stand a chance of getting the President we need until the 'R' side comes to terms with reality. Every autumn when the first frost comes, I have to deal with a few mice in the house. So I set out Victor traps in effective locations. When the trap kills instantly, no problem. Just pick up the trap by the wooden part, and take it out to the trash. This morning I woke to find an odd combination of dust scattered around the kitchen floor. After puzzling it out, I realized a mouse must have been dragging a trap around. I explored the house on tiptoe, and soon located the problem by hearing the noises. The mouse had ended up under my computer desk, with its leg in the trap. Well, at this point I had several choices. I could behave like a Bush: ask the UN to write me a resolution, then ask Jimmy Carter to arrange an election among the other mice to determine what should be done. I could behave like a Republican Congressman: bring in the media, focus their cameras on the poor little mousie, and blame the opposition for creating this horrible situation. Or I could behave like a relatively mature and sensible human: Eliminate the mouse in order to have a livable house. I took the third path. Closed my senses to the pleading eyes and plaintive squeaks, grabbed the trap with pliers, dragged the mouse backwards under the side of the desk, and took it out to the trash barrel. Not as much fun as the other options, but it has one minor advantage: it preserves my little corner of civilization. Martha Mears was fairly well-known in the '40s; she was the behind-the-scenes 'dubber' for several leading ladies who couldn't carry a tune. For some reason she never gained star status on her own. Why, I don't know. Lord, lord, lord, what a voice! Fantastic range in both senses of the word: tenor to soprano, sultry vixen to pure angel. In '44 and '45, Mears hosted "10-2-4 Ranch", a daily 15-minute show sponsored by Dr Pepper. The show consisted of songs and banter by Mears and the Sons of the Pioneers, mainly in a western spirit. Only a few of the episodes have been preserved by the old-time-radio archivists, which is unfortunate. It appears to have been aimed mainly at our boys overseas. Finally, a hymn that sounds like early 20th century sacred music, perhaps Benjamin Britten. I can't find any references to the words online, so its source is somewhat puzzling. And Martha does it --- well, I can't say anything. PS: Found the hymn. It's the 'Evening Star' aria from Tannhäuser. The words aren't the same; perhaps altered by the Sons of the Pioneers to suit their purpose. Rush is using the case of Lynne Stewart to illustrate how the Clinton approach to fighting terrorism is different from the Bush approach. Attorney Lynne Stewart committed sabotage by helping her terrorist client communicate with his followers overseas. She should be put to death, and it's certainly true that the judge who gave her a lenient sentence is a Clinton appointee. However! This doesn't demonstrate any difference, because the Bush admin hasn't done anything to change this sentence. And the Feds can certainly do that: remember how Bush Senior decided Rodney King was an angel, and kept on trying the Los Angeles cops until he got the proper verdict exonerating Rodney King and punishing the cops for doing their job correctly. If we want to argue that Bush is doing things differently, we'd have to see that Bush is in fact doing things differently. But he isn't. And while I'm knocking Rush, one more thing. He (along with most of the Brand 'R' talking-points vendors) insists that "you can't win by losing." Sounds good, but doesn't make sense. The whole point of having a free-market system with competition - and for that matter the whole point of having life - is to learn from experience. A business gets a signal that its product is inadequate when nobody buys the product. A sports team gets the message that it needs to replace the coaching staff when it loses too many games. A political team (party) won't learn that its coaching staff is incompetent until it gets the message by losing elections. If voters decide not to give the signal, we are just postponing the day when the party will learn how to perform properly. President Wilson is giving a singularly unenthusiastic speech at the dedication of the Air Force Memorial. Phoning it in, as they say... Along with his usual fake-Lincoln lines, he just said something that reveals how far behind the curve his admin really stands. "Those extremist folks are still determined to find failed states somewhere in the Broadermiddleeast, and to hijack those states into tyrannical bases for operations." Is there any evidence for that? Unless I've missed something, all the evidence shows that Jihad no longer needs a central base of operations. Osama was able to use Sudan, then Somalia, then Afghanistan, during his development and training process. At this point, there is no need for a 'hijacked nation', because Osama has succeeded in his original goal of spreading Jihad across the world. This spread didn't happen because we were fighting, as the Left loves to say; it happened because it was the natural second stage of Osama's plan, and it happened because we were not fighting intelligently and intensely. If our strategy is still focused on Stability, and focused on preventing Failed States, we are still fighting Phase 1 while the enemy has moved to Phase 2. Still not in a bloggy mood, but had to break the spell to say a loud BRAVO to the Bush/Wilson admin. They're finally getting around to using our laws and constitution to fight the war, after 5 years of allowing "judges" to use illegal and illegitimate versions of the constitution to serve the enemy. Specifically, they've finally charged someone with treason, and a well-deserving someone: Adam Pearlman-Gadahn, the California Leninist who has become Osama's head of propaganda. I suppose this is just an election-time gimmick, and I suspect the charge will sort of disappear after November. Even so, it's an important 'first shot' in the legal front of WW4, which up to now has been a complete retreat by Bush/Wilson. If they were serious about the legal battle, we'd have half of all Federal "judges" in jail already. The term 'Kyoto Protocol' may acquire a new and much more positive meaning! Shinya Yamanaka and Kazutoshi Takahashi, at Kyoto University, have developed a new and nearly magical recipe for turning your own skin cells into 'pluripotent' stem cells, which can be re-inserted into the body to re-grow bad tissues and organs. Their method already works in mice, so it should (but not necessarily must) work in humans. The Yama-Taka method does not require any sort of contribution from embryos, so it has no ethical problems. 1. Start with a scraping of skin cells. 2. Use a virus to force certain DNA code segments into the cells. These DNA segments tell the skin cells to 'de-mature' into a much earlier and less specific type of cell. 4. The immature personal cells will pick up the chemical signals from the surrounding cells, and will grow into new and healthy specialized cells, replacing lost or damaged tissues. Worth noting: the Japanese are obviously not affected by our federal funding limitations or our ethical debates. They've simply found a good solution. If American researchers haven't pursued this line, it's not because of Bush's limitations; it's because of their own slowness ... or perhaps because they are anti-religious. The more promising course happens to be the one that doesn't kill embryos. American and European researchers seem to prefer the one that does kill embryos. Have to conclude that they enjoy 'having the issue' more than they enjoy solving the problem. Why can Dems get away with corruption while Reps can't? Pure bias is part of it, but there's a deeper factor involved. Vested interest is always and properly the main factor in voting. The framers of the Constitution planned our system to use selfishness and vested interest as its main fuel. We're not supposed to 'vote in the public interest', and anyone who tells you to vote that way is hiding an entirely different agenda. Selfish voting creates a basic problem, though. Parties of the Left come bearing a cornucopia of concrete gifts. Things you can see and appreciate. Subsidies, welfare, special privileges for favored races and classes. Parties of the Right come with empty hands. At best they can offer negatives and abstractions: we will stay out of your way; we will defend the country more competently; we will lower your taxes. Both parties are jam-packed with smelly corruption. The Left has so much more on the table, so many pretty and rich goodies to give us, that the corruption is swamped. We don't see it or smell it. The Right can't swamp out the nasty smell. Negatives and abstractions don't have any nice aromas or pretty colors. And when the party of the Right fails to offer a clear and competent image of those abstractions - can't fight a war properly, can't block lawsuits, can't limit spending, won't increase energy supplies - there is absolutely nothing to hide the nasties. An interesting Initiative will be on the ballot here in Washington in November. It aims to discourage theft by governments. The Property Fairness Initiative, Prop 933, is mainly sponsored by the Wash Farm Bureau on behalf of farmers. 1. Tell us why they want new regulations. 2. Identify the properties they want to regulate. 3. Identify how much damage they will cause to the use and value of private property. 4. Determine if voluntary, cooperative programs can accomplish the goal. If the politicians and agencies then decide to damage the use and value of private property, they must follow the state Constitution and pay for the damage. It broke into the news yesterday when a counter-group, sponsored mainly by ecofascists, issued a "scientific" study that "proves" the initiative won't work. This counter-group, based at Univ of Wash in Seattle, has "done the research" and "run the numbers", determining that the Prop will cost about $8 billion each year; they say it will bankrupt counties and cities. Well, now. How does science work? By observation of reality. If the question involves a cause-and-effect relationship, scientists are supposed to run an experiment. But how do we run an experiment here? Aha! We don't have to run an experiment. It turns out that Oregon passed a nearly identical proposition two years ago. Oregon is nearly identical to Washington in every way that matters: population, history, geography, economy, ethnic makeup, main industries, climate, political tendencies. So, did Oregon go bankrupt? Nope. Every time the proposition was used, the governmental entity backed off and revised or revoked the regulation. That's science. We have a valid experiment, showing that the idea works exactly the way it was meant to work. 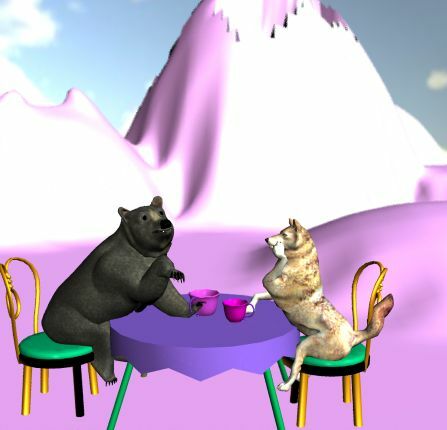 Despite all that, the academics at UW will certainly get the credit for doing a "scientific study" because they are speculating and using computer models. This is a huge problem in today's world, not just in science but in news and culture as well. We have somehow picked up the axiom that theories and computer models are truth, while demonstrable, valid, and appropriate facts are irrelevant. Slow and Stupid part II. Since I've started the theme, might as well carry it into today's Big Story, Mark Foley flirting with the boys. Slow and Stupid: perfect description for Republican leaders. Down to the basics. "What can I get away with?" is a question any human can answer by about age 3. Even dogs and cats can determine the answer to this question easily, when the punishment and rewards are consistent enough. And in this case the punishment and rewards have been totally consistent since about 1975. The media have been punishing Republicans for every hint of dirtiness, especially sexual dirtiness, without exception for thirty years. And the Republican elite STILL hasn't figured it out. I have no idea what goes through their heads: do they believe reporters are their friends? Do they think the Golden Rule applies? In either case, they are simply stupid. They are clinging to an idea that has no basis in reality. Yes, the Dems can get away with anything. No, it doesn't help you to point out the unfairness. You're supposed to be leaders. If you can't figure out a dozen ways to turn this constraint into an advantage, you don't deserve to be leaders. This is important to many voters, but you can't make the claim unless your behavior confirms it. It's also important on a more basic level: Clean leaders can't be blackmailed, thus clean leaders are free to speak and act in controversial directions when needed. Footnote: When I say "clean leaders" I'm really saying "Mitt Romney".